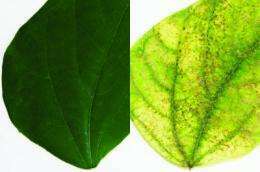 (PhysOrg.com)—An international research team decoded the genetic blueprint of the two-spotted spider mite, raising hope for new ways to attack the major pest, which resists pesticides and destroys crops and ornamental plants worldwide. The voracious mites, which technically are not insects, can eat more than 1,100 plant species – a rare trait. 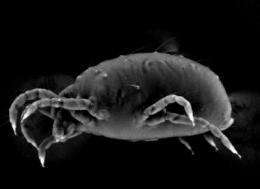 The mites' newly revealed and sequenced genome contains a variety of genes capable of detoxifying pesticides as well as toxins plants use to defend themselves, the scientists report in the Thursday, Nov. 24 issue of the journal Nature. "One key thing that makes spider mites unique is they can eat many, many different plant species," says Richard M. Clark, one of five main authors of the study and an assistant professor of biology at the University of Utah. "These mites are often house plant pests – a major cause of people's house plants turning yellow and getting sick. They also are a major problem for agricultural nurseries and greenhouses, and for field crops." Primary targets are tomatoes, peppers, cucumbers, strawberries, corn, soybeans, apples, grapes and citrus. Clark says the new study's "importance is largely in understanding how animals eat plants, with the long-term goal of developing effective ways to prevent crop damage from mites and insects. If we can identify the biological pathways mites use to feed on plants, we can potentially identify chemical and biological methods to disrupt those pathways and stop the mites from feeding." The two-spotted spider mite, which is no more than 1 millimeter long, "is a major global pest, and is predicted to be a growing concern in a warming climate because they multiply extremely fast at high temperatures – 90 degrees Fahrenheit or more," he adds. "They do really well in hot and dry climates like Utah." Yet, the two-spotted spider mite "has been found to rapidly develop resistance to multiple types of pesticides, often within a couple of years after a pesticide is introduced," says Clark. "It is resistant to many common pesticides used against insects." The Nature study deciphering the genome of Tetranychus urticae, the two-spotted spider mite (which has two red spots), was conducted by an international research team of 55 scientists from North America, Europe and South America. Besides Clark, the other primary authors are biologists Yves Van de Peer of Ghent University and the Flanders Institute for Biotechnology in Belgium; Miodrag Grbic of the University of Western Ontario, Canada; Thomas Van Leeuwen of Ghent University; and Rene Feyereisen of the University of Nice Sophia Antipolis in France. Decoding the spider mite's genome required dozens of scientists with expertise in various gene families. Clark mainly studied which genes are "expressed" or activated and thus make messenger RNA, or mRNA, which in turn is used to make proteins. The study found that the two-spotted spider mite has 18,414 genes. Clark and University of Utah graduate student Edward J. Osborne found that 15,397 genes are "expressed" or activated to make proteins. The spider mite genome contains about 90 megabases – that's 90 million "base pairs" of DNA letters (A,C, G and T) – which is the smallest genome yet sequenced for any arthropod, which are invertebrate or spineless animals with external skeletons or exoskeletons, segmented bodies, and appendages with joints. "Many of the other genomes are enormous," some close to 3 billion bases, or about the size of the human genome, and some up to 7.1 billion bases, Clark says. Arthropods include hexapods (insects and insect-like animals), crustaceans (lobsters, crabs, shrimp, barnacles), myriapods (millipedes, centipedes) and chelicerates (spiders, scorpions, mites and ticks). Chelicerates are the largest group of animals after insects. 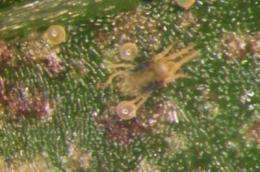 The two-spotted spider mite is the first chelicerate to have its genome fully sequenced. While there are other species of plant-feeding mites, the researchers chose to sequence the genome of the two-spotted spider mite "because of all the spider mites, this is the most widespread because it feeds on so many different plant species," Clark says. Uses a different molting hormone to shed its exoskeleton during growth. Has only eight Hox genes to orchestrate body-plan development, compared with 10 in most other arthropods, and thus has only two main body segments instead of three. There are other cases in which Hox genes were activated differently in different arthropods, "but this is an extreme case," Clark says. "The genes are both gone. Makes silk that is strong like spider silk but 185 to 435 times thinner. "Spiders spin silk from their abdomens, spider mites from the head region," Clark says. Spider mites use silk to hide from predators, keep themselves warm, and suspend eggs out of predators' reach. Silk from the mites may prove useful as biodegradable surgical sutures and bandages. It "is very thin and very easy to get because you can grow lots of mites on plants," Clark says. The spider mite genome also revealed the presence of "families of genes involved in breaking down toxic compounds, either in plants poisonous to the spider mites or in pesticides," says Clark. "You would imagine that if these mites feed on such a broad number of plant hosts, they would have many genes known to be involved in breaking down toxic compounds. And we found that they did." In some specific families of detoxification genes in the spider mites, "the number of genes was about three times that seen in other arthropods," he adds. As part of the study, the scientists took a specific strain of spider mites that normally eat kidney beans and transferred them to tomato and thale cress (Arabidopsis) plants. On these new plants, the mites "expressed" or activated different genes and thus made different detoxification compounds so they could eat the new plant species. Some of those detox genes were previously unknown and thus provide new insight into how mites counteract plant defenses. For example, half of the cytochrome P450 family of detoxification genes changed expression – turned either on or off – when the mites were switched to the new plants. That is a bigger change than seen before in any group of animals, Clark says. "This suggests that these genes are critical for the ability of mites to be pests on many different plants." Clark says the spider mite has 39 genes from one drug-resistance gene family (and the proteins they encode), compared with only nine to 14 in insects and vertebrate animals. That shows how an expanded set of genes evolved to help the pests feed on numerous plant species. In a yet-unexplained mystery, the two-spotted spider mite has some genes similar to those in bacteria and fungi. "They somehow captured them from other organisms in the environment and now are using them for their own growth and persistence," says Clark. "They are mostly enzymes involved in changing other small molecules. The hypothesis is these genes may be involved in modifying [detoxifying] toxic compounds found in plants."